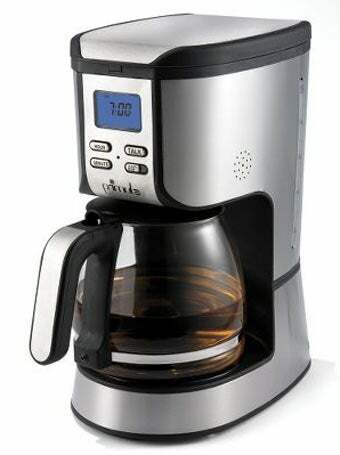 Here's a fantastic idea for a product: A coffee maker that responds to voice commands...just not a voice command to "make me some freaking coffee!" This is the first voice-interactive coffee maker that asks, "Would you like to set the clock or set the coffee brewing time?" and operates in response to your verbal commands. Simply saying, "Set the coffee brewing time," or "Set the clock," will prompt the machine to reply, "Please say the time, including AM or PM." It uses an advanced voice recognition system to identify any time of day you speak, eliminating the hassle of fussing with buttons. Sure, the one instance that you ever have to program the time on your coffee maker is a tad inconvenient, and I can appreciate the UI improvement of any gadget. But as long as we're using voice commands and $100 coffee makers, we might as well open the door for new functionality. "Brew 4 cups of coffee" or "tea earl grey hot" would both be welcome commands that could save you time and prodding on a daily basis. * To be fair, maybe Hammacher Schlemmer just failed to mention the "make coffee" command. Even if so, the fact that you'd need to press a button to issue the order sort of negates the convenience.